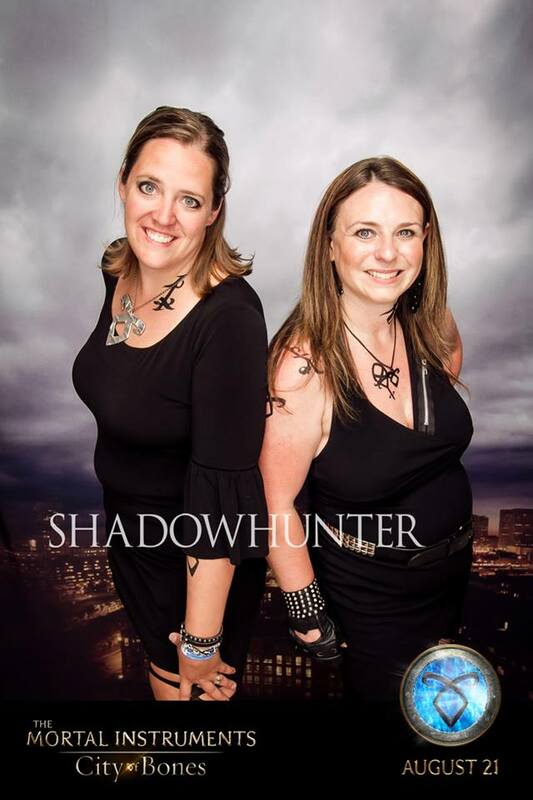 Fangirls Moms began in the summer of 2013 when friends Casey and Jolene discovered their shared passion for the book The Mortal Instruments: City of Bones and the excitement of it being made into a movie. When it was announced the author Cassandra Clare (Cassie) would be appearing along with several cast members at the Mall of America, 5 hours away, the first Fangirl Moms trip was planned. To prepare for the trip, Casey and Jolene decided to have a professional photo shoot done in full cosplay. They made steles, bought weapons, and looked “better in black than the widows of our enemies since 1234”. They used those photos to make a short Graphic Novel for Cassie as a gift for bringing the Shadowhunter world to life for them. Unfortunately, Cassie fell ill and was unable to make it to Minneapolis but that didn’t stop the Fangirl Moms from camping out over night at the mall to ensure being able to deliver their gift to the cast for Cassie. They made several fangirl friends and had so much fun they didn’t want it to end. Live tweeting the event caused their follower numbers to rise and the Fangirl Moms loved being able to interact with Shadowhunters from all around the world! But these fangirls are fans of more than just The Mortal Instruments and The Infernal Devices series, also by Cassie, and that is when the FANGIRLMOMS.COM website was born. Fangirl Mom Casey is the mother of two girls (14 & 4) and is an Elementary School teacher. Fangirl Mom Jolene is the mother of a girl (6) and a boy (4) and works at local High Schools as a substitute teacher. Both women are happily married with supportive husbands who appreciate them having an outlet for their fangirling. Check out www.fangirlmoms.com for information on books, TV shows, movies and celebrities.